After 1982, the Central Council was able to bring about a fundamental change in the discriminatory practice of reparation for the surviving victims of Nazi persecution. Even after the Federal Court of Justice had justified the decision of the compensation authorities to reject the compensation claims with racist explanations and by invoking its judgement of 1956, the Central Council achieved a resumption of the earlier denied proceedings, which in over 3,500 individual cases led to new decisions by the compensation authorities. This granted the victims the previously denied compensation for the concentration camp imprisonment and for the incurred loss of training and education, as well as pensions for the physical injuries they had suffered. Furthermore, due to the efforts of our office in Heidelberg, the Swiss bank trust made a one-time payment to 2,900 Sinti and Roma Holocaust survivors in the late 1990s, as compensation for the financial and property losses incurred because of the Nazi deportation. Since 2000, the Central Council has supported 1590 compensation claims of the victims who had been condemned to slave labour in concentration camps; this was done in cooperation with a fund established by the industry and the Federal Government. The Central Council has also processed compensation claims in accordance with the “ghetto pension bill” and the policy of the Federal Minister of Finance concerning the “benefit in recognition” (2,000€) of the suffering endured in ghettos in the former “German Reich territory”. As a result of negations between the Central Council of the German Sinti and Roma and the Federal Ministry of Finance in 2009, this policy was later expanded to include Sinti and Roma camps and detention centres in the territory of the former German Reich. Negotiations with the Federal Ministry of Finance take place regularly. The latest result of these negotiations is a simplified application procedure for the federal hardship provisions (the same one as for the Jewish victims of persecution). 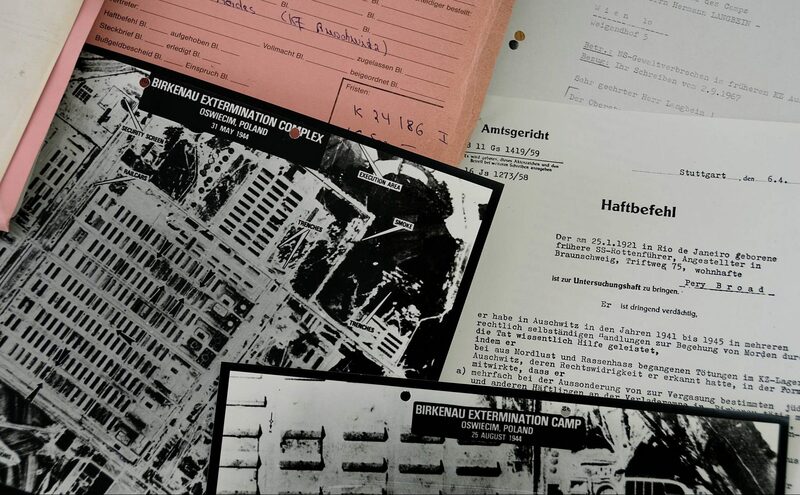 Since it was founded, the Central Council has been reappraising and documenting the genocide of the Sinti and Roma as well as seeking prosecution for the surviving SS-perpetrators. In this, the Centre often works in cooperation with Simon Wiesenthal and with authorities in Germany, the USA, Israel and Argentina. 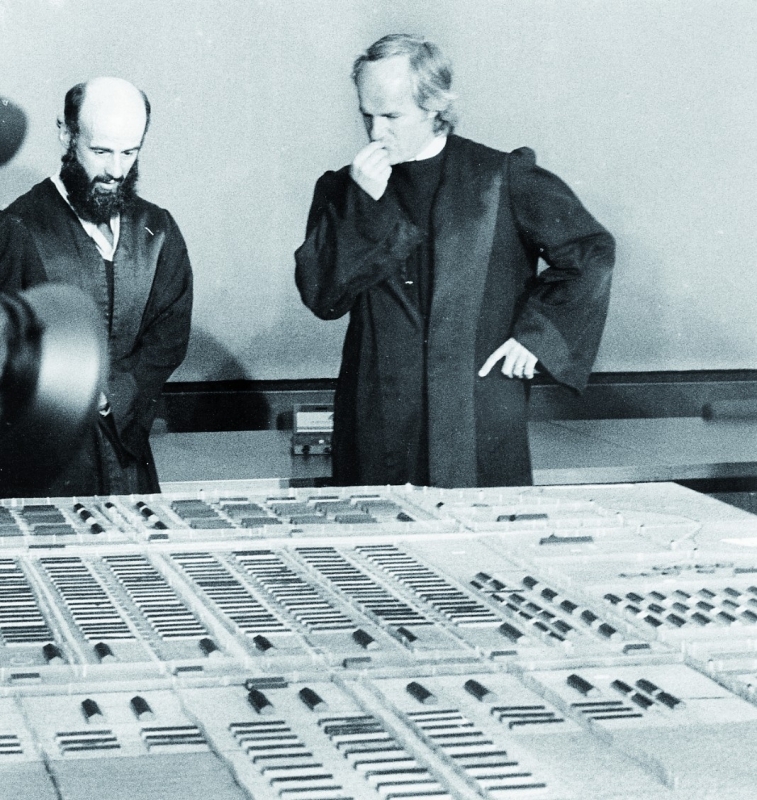 The lawyers Arnold Roßberg and Ulrich Roeder, representatives of the accessory prosecution in the König trial, in front of a model of the Auschwitz-Birkenau concentration camp. An overview of still relevant regulations concerning the compensation of Sinti and Roma is provided below. Victims of persecution cannot file new claims for compensation under these restitution laws after 31 December 1969 – only claims that were filed before that point in time can be processed. This means, however, that those persecuted can if need be apply for a ‘damage to health’-pension because of increased ailments. Under certain circumstances, it is also possible to apply for widow’s or widower’s pension. Many Holocaust survivors were unable to meet the application deadline of the Federal Compensation Act or for some other reason did not receive any compensation based on previous laws. Because of this, various hardship funds for the victims of Nazi persecution have been established over the years. they had to live as illegal migrants, or to live in hiding under inhumane and particularly severe conditions for six months, which resulted in long-term damage to their health and a degree of disability of not less than 50%. The directive concerns the payment of compensation to persecution victims who were detained in a ghetto, worked without coercion during this time and were paid either wages or received benefits-in-kind.